LATEST (12th April 2016). The children’s cycle area has been painted with road markings and mini road signs have been installed to create an excellent space for youngsters to learn to ride and understand road safety. The immediate popularity of the space has been evident to anyone at weekends, after school and during holidays. The improvements are now completed. 23 February 2016: The perimeter hedge has been in for a couple of weeks, together with some new shrubs around the outdoor gym and the first of several birch trees in the cycle path area. They obviously need some time to establish and grow but already they look very good and help create a stronger aesthetic to the Green. With the (community planted) daffodils starting to flower at the top of the Green and the blossom trees a few weeks from flowering, this Spring will see the Green looking its best ever. 4th November 2015: Planting update: Hedging will run along the perimeter fence on The Avenue and Tiverton Road. This has been specified by Brent council and will be planted in late November/early December. Subject to costs this will be either photinia or beech. Five birch trees have also been specified for the MUGA and climbing wall area, along with shrubs to be planted near the gym. The ‘No dog’ signs have also been ordered to go on the five entrance gates to the activity zone, as there have been several complaints of dogs being taken into the gym and MUGA areas. Waste bins, we are told, will have to come in a future budget year. 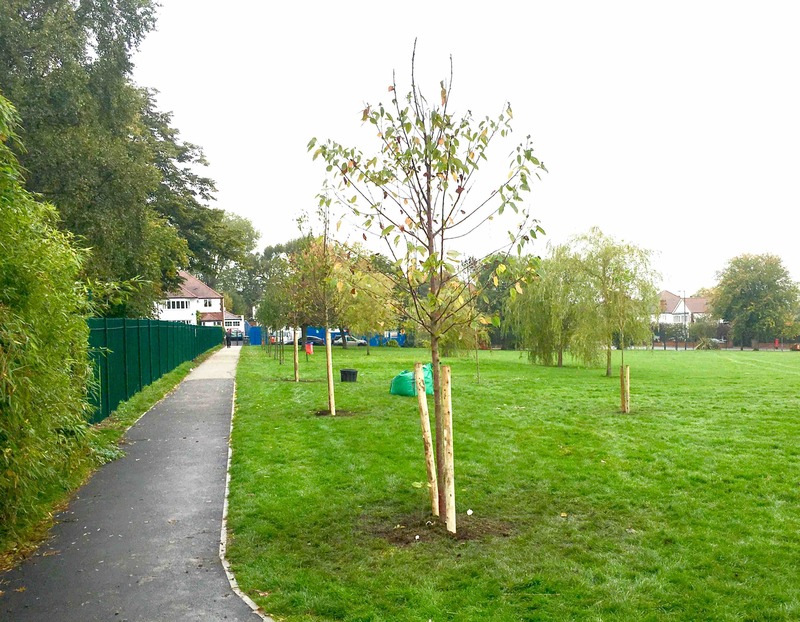 Elsewhere on Tiverton Green you may have noticed a number of new trees along the top path. These replaced the trees removed by Thames Water during their excavations last year. Thames have additionally paid for new fruit trees and 3,200 bulbs – all of which will be planted by the community on Saturday 14th November from 9am – volunteers required please! 12 August 2015: So it’s finally open! After four months on site, the safety fences came down and the new MUGA and climbing wall opened to the public on Friday 7th August. It’s a pleasure to see such a wide age group using the facilities already, from toddlers and teens to parents, so let’s hope it inspires many more of our local kids to exercise regularly and practise their ball skills. We’ll try and organise an opening event when more people are back from summer holidays. Still to come is the landscaping (trees, perimeter hedges, grass), table tennis tables, waste bins. 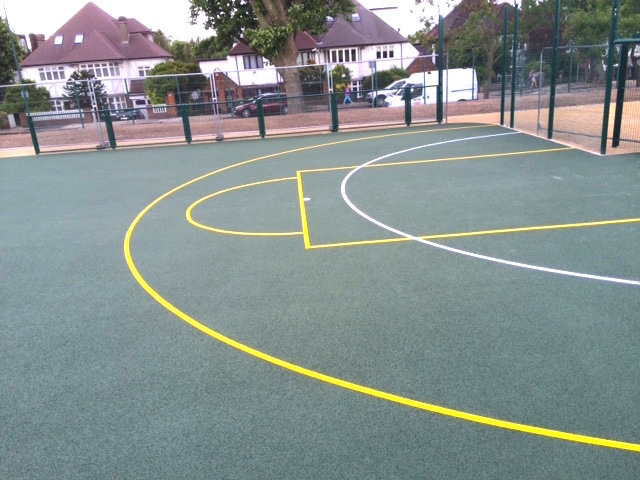 6th June 2015: Mid-June is now looking unrealistic as a project completion date, but the MUGA sides are nearly all up, so hopefully the playing surface will be laid next week. 12th May 2015: As you’ve probably seen, the contractors started work in early April, clearing the old tarmac and laying the base for the MUGA. We’ve been told it’s a 10 week project, which would take us to mid-June. due to soil testing to make sure there was no asbestos (there isn’t!). A three month delay for this reason was rather unwelcome but at least it’s back on track…There can’t possibly be any more delays, can there? 3rd January 2015. Work on the old tennis courts will now not start on January 5th after all. ‘Ground work surveys’ needed. Not sure what this means for timings. More here. 3rd December 2014 We’ve had confirmation from Thames Water that, they’ll not only restore the trees, grass and paths once they leave in March, but they’ve made a £14,800 contribution to improve the kids playground. More here. 30th November 2014 Work has been delayed another month and will start on January 5th, but still with the target completion of Feb/March. Planting will follow. More here. 24th October 2014 Work will start on the MUGA and climbing wall in early December, with a target completion date of February/March 2015, weather permitting. After 27 years of disuse, work has begun on the Tiverton Green tennis courts to turn them back into a space for exerciseand recreation, for free use by the entire community. After the consultation study in 2010-2011, which resulted in plans being agreed with the community and local schools, things went a bit quiet. Changes to the structure and personnel at the Parks Department (now Sport, Leisure & Parks) delayed progress, but the plans have finally been approved thanks to some real commitment from everyone involved. The outdoor gym equipment that was installed in summer 2013 has already proven to be a big hit with young and old alike. Brent residents have the worst record of zero-day exercise of any London borough, so it’s particularly good to see free equipment being used by those who might not otherwise keep fit. Funding has now been secured for the entire project (NHS paid for the outdoor gym equipment and section 106 monies will pay for the cycle circuit), and in January 2014 we received approval of full funding for the facilities on the eastern side of the site with a fabulous grant from The London Marathon Trust. The grass area of the Green will remain as it currently is – an open space for use by dog-walkers, joggers and people enjoying this precious community space in North West London. Great to see a website for our Green! Getting teenagers shooting hoops or doing other sports on the new space will give them a healthy alternative to “hanging loose”. Let’s all support the new planning application. Ever more kudos to all behind this scheme. who knows, some day coffee/tea kiosk might be added and so on. Thanks to the council and the neigbourhood association. We’ve sent our letter of support to Brent. Thanks for this! Well done – its all brilliant. We have started the QPCS annual 5km fun run here for the last 5 years. We should try and get more local residents involved and taking part! A very good news indeed. Once more kudos to all behind to make this a reality. Cheers all. This is a fantastic community project that is great for the area. Well done to those involved in making this happen, I can’t wait to use the space. well done to everyone who has been part of the transformation of tiverton green – you are local heroes! Thanks Margaret, we’re so pleased it’s so popular. really looks great – and what a nice green space for everyone to use in the community. hope that everyone respect the space and other users – and enjoys! Tiverton Green is looking fabulous. Thank you to all who have transformed ‘Dog poo Park’ into a genuinely attractive park. So nice to see kids exercising there every day after school and at weekends.